Difference between revisions of "Using MythTV"
press [[Image:RemoteExit.png]] to go back to the recordings browser. 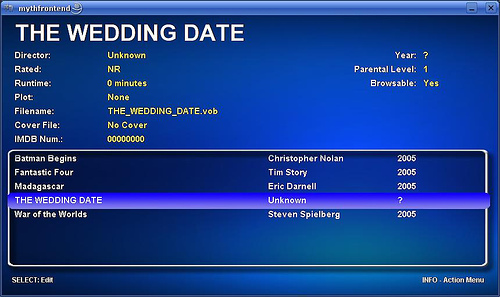 Press [[Image:RemoteInfo.png]] to bring up the Recording Information popup. You can see what Recordings are in the recording Playlist by selecting the "All Programmes" group. Selected Recordings are highlighted in yellow. You can see what recordings are in the recording playlist by selecting the "All Programs" group. Selected recordings are highlighted in yellow. 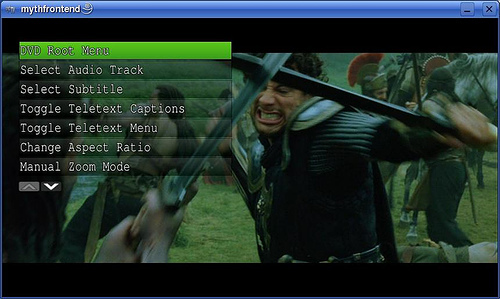 While you are in the Recording Browser press [[Image:RemoteMenu.png]] and select "Playlist Options". You can now choose to play the Playlist sequentially or in shuffle mode. MythTV has been designed to be used via the "10ft Interface": you should be able to drive its day to day functions from 10ft away sitting comfortably on your sofa. You can see a collection of Themes available here MythTv Themes. When you select Watch TV from the front page, MythTV will automatically go to the default channel when you setup the mythbackend. You can also have it go directly to to programme guide. While watching Live TV you can change channels with . 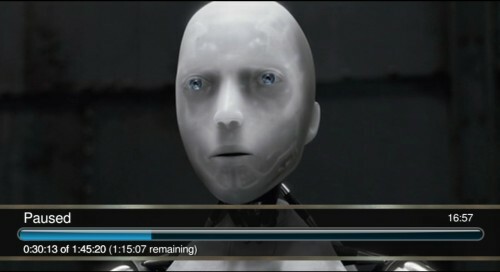 There is a pause of several seconds while MythTV buffers the new channel. People often find this pause disconcerting as they are typically coming from a normal TV where they are used to "Channel Surfing", though it's fairly common on digital cable TV service, as well. The way to overcome this is to put MythTV into Browse Mode, and this will become the default as of 0.19 for precisely this reason. check the box "Always use browse mode when changing channels in LiveTV". Press to browse the program information on the next/previous program with the OSD. Then when you see the program you want, press and MythTV will jump to that channel. While in Browse mode you can also use to see what shows are coming up next, by scrolling the program guide earlier and later in time. You can also jump directly to a channel by pressing the number keys. Press 1 and it will jump to the first channel in your channel list, press 12 it will jump to the twelfth channel in your channel list etc. 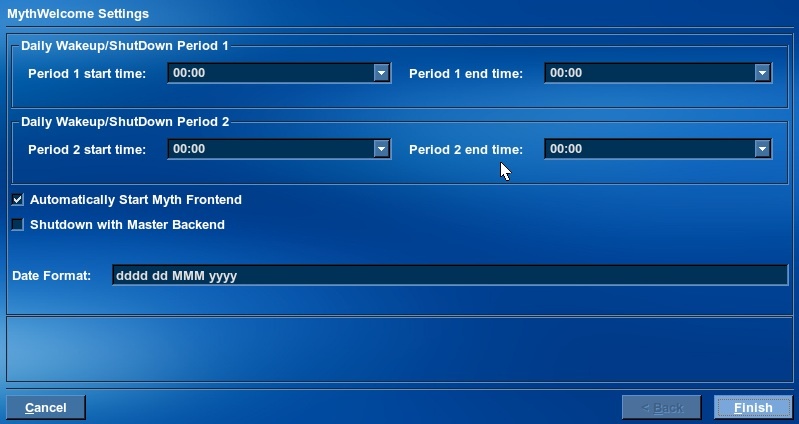 You can organise your channel list with the MythTV-Setup program. The OSD will show the volume provided you have set MythTV to use its internal volume controls. It is possible to set MythTV to bypass its internal volume controls and send the audio directly to your soundcards SPDIF output. In this case you should program your remote's volume up and volume down keys to control the volume on your AV amplifier. You can step through the different screen aspect ratios with the key. 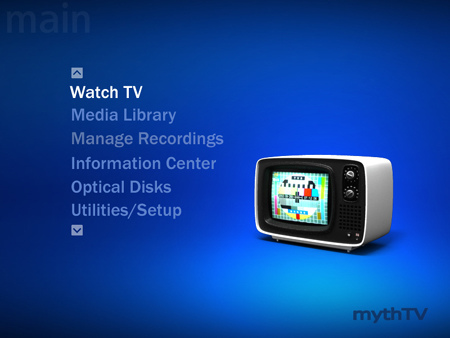 MythTV offers some of the most sought after features of modern Media Centres. Pausing live TV is great when the phone rings during a show or your little ones need a comfort break during a movie. 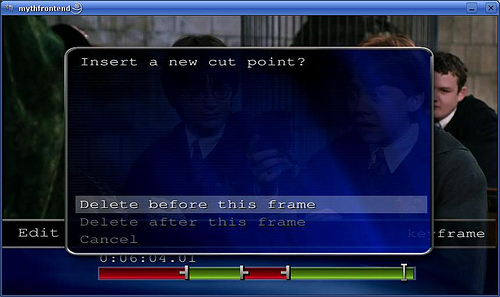 By pressing on your remote the picture will freeze, and MythTV will start to buffer Live TV to the hard drive. The OSD will appear showing seconds behind realtime TV and (in version .18) how much live TV has been buffered as a percentage of total buffer space. In .18, if you changed channels or exit from watching Live TV then any buffered TV will be lost. 0.19 changes this by treating live TV as a recording and saving it in your media list. The live tv recording is set to auto expire when the hard drive nears being full. Press a second time to unpause live tv, you will now be watching 'behind' live TV. This is sometimes referred to as Chase TV Playback for obvious reasons. With Chase TV Playback the system can be recording live tv while you are watching the same program behind realtime. It is somtimes referred to as Timeshifting TV. If you are coming to MythTV from using a Video Recorder, you might want to enable the "sticky" keys option. This keeps the fast forward or rewind on even after you release the key. Subsequent presses of or will increase the speed of the rewind or playback. When you reach the point you want to watch, press to resume normal playback. At the 0.17 release of MythTV the concept of Timestretch playback was introduced. Though, it's really 'time-compression'. This allows the user to adjust the playback speed slightly, but keeps the audio at the same pitch. If you're recording a lot of shows, timestretch lets you get through them faster. So now you can watch a 1 hour show in 40 mins without feeling like you are listening to Alvin and the Chipmunks. During Live TV you can use this feature to play the TV Stream in slow motion, nice for instant reviews of sports events. Press to toggle the Time Stretch playback. Press the to set the Time Stretch speed. The Electronic Program Guide will allow you to get more detailed information on what is being broadcast currently as well as scheduled programs that are coming up. Press and the On Screen Menu will show. Use / to move up and down the menu. Use to Select. 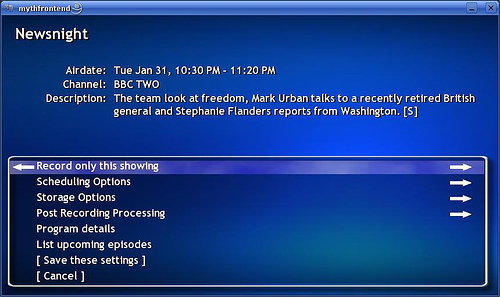 Select the Program Guide and the Full EPG will show. Use to switch to full-screen Live TV on the channel you selected, or just press to go back to watching Live TV on your original channel. When you press a number key MythTV gives you 2.5 seconds to enter additional digits, (These are displayed on screen as you press), after which it will jump to the closest channel it can find that matches the digits you have pressed. 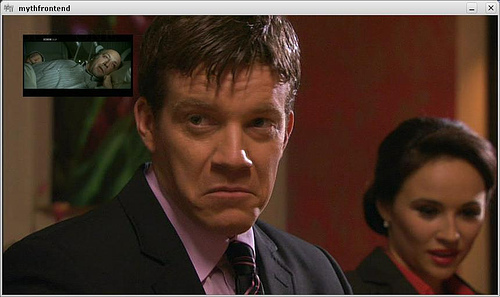 If you have multiple tuner cards you can watch two channels at once using the Picture in Picture (PIP) facility. 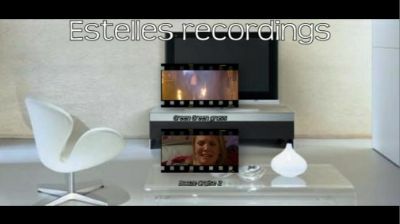 You can record one programme while you are watching another. 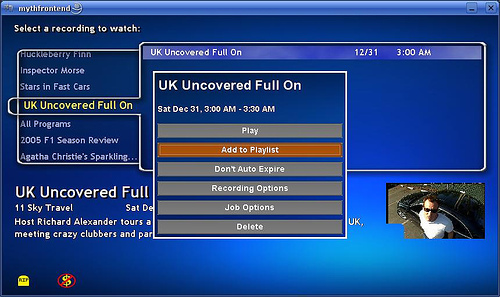 Turn on the PIP via the Onscreen Menu by pressing the key while watching Live TV. Press the key to switch between your various tuner cards. While watching Live TV press the key, MythTV will start recording the show from the point that you started watching it until the show is finished, according to the Guide schedule. This might cause some rescheduling of later recordings. The Tuner card being used to record from will be locked until the recording has finished or you explicitly cancel the recording. If you have multiple Tuner cards you can now change channels with the keys. 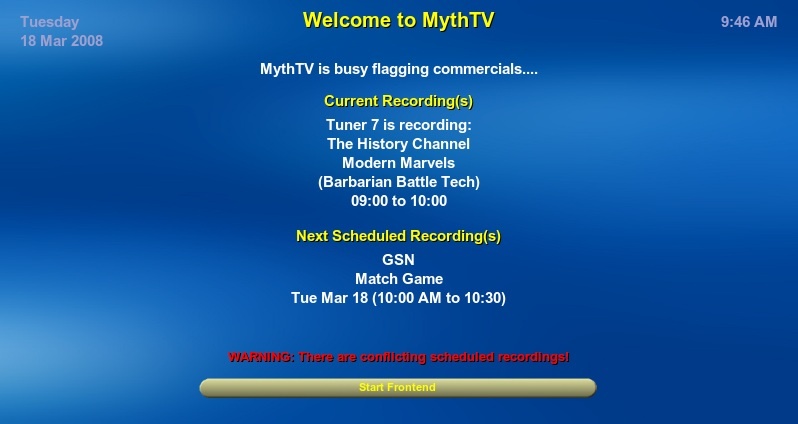 MythTV will continue recording the current show and switch to the next available Tuner card. If there are no more available Tuner cards then the keys will just jump back and forth in the recording. Press the key, and the OSD will show the position in the recording. Use the , keys to move backwards and forwards in the recording. Press the key, and the On Screen Menu for Recordings will show. You can exit the watching recordings with the key. 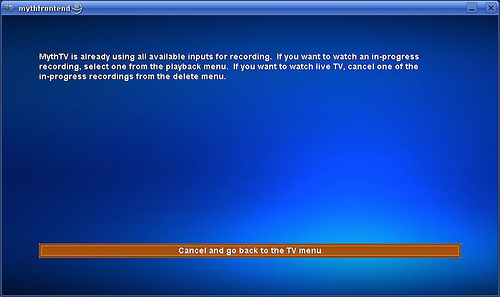 If you try watching live TV and all the Tuner cards are busy recording, you will get the following screen. The Recording capability of MythTV is its most powerful feature and sets it apart from just about anything else on the market. It allows you to have complete control of even very complex recording scenarios. There are three ways to find the shows that you want to record. This is good for recordings coming up in the next 24 hours, can be difficult if you want to schedule lots of shows, or don't know where and when they are being transmitted. This is good for scheduling lots of shows as well as when you want to schedule something that is more than a day away, saves lots of scrolling and searching the EPG. Use , keys to select your shows to record. If you have multiple tuner cards, MythTV will try and resolve schedule conflicts by searching for repeat broadcasts of the same show as well as trying to handle non broadcasts due to changes in schedules. 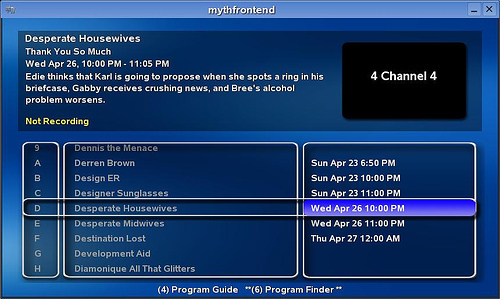 For recording of multiple episodes of a show, MythTV will look at the episode information to identify unique episodes. Select the show that you want to record and press the key repeatedly to cycle through the record options. A record icon on the guide will show which option you have selected. Record only this Programme at this specific time and this station. This is the best way to be sure that a certain showing is recorded. However, if the TV listings change and the show is not broadcast at that time, the show will not be recorded but will be marked as Not Listed to let you know that you should investigate. 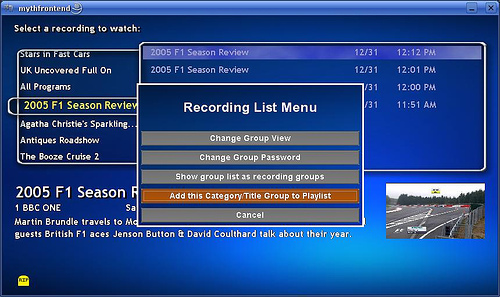 Record a title once from any of the times that appear in the TV listings. This is useful for recording a movie or special that has multiple showings because it allows the scheduler to choose one that doesn't conflict. It is not a good choice for recording a single episode of a series because it records the first available showing of the title without regard to the episode information. 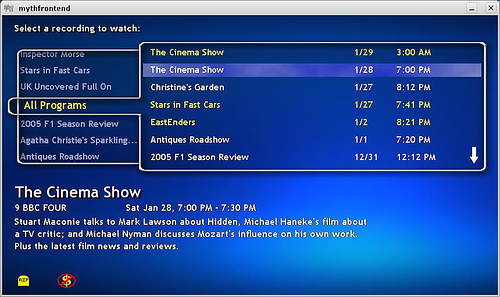 Record a show whenever the title is listed on the same channel, weekday and time. Note that if the TV station changes the schedule for a special episode, it would not be recorded. However, you can add a single record for the special episode. Record a title once per week from any of the times that appear in the TV listings beginning from the time of the showing that was selected when the rule was set. This is useful for news, current events or other programs where the same episode is shown several times each week but the listings may not include descriptive information. This may not be a good choice if there are different episodes shown during the week. 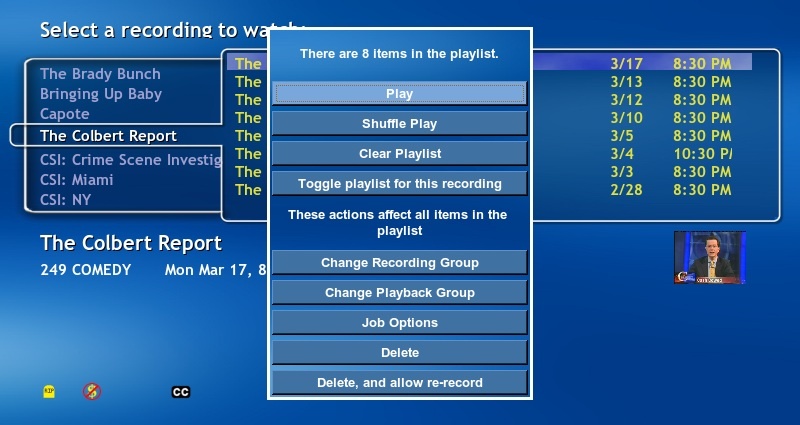 Records a show whenever the title is listed for the time and station on any day of the week. Here again, a show will not be recorded if the time was altered by the station. 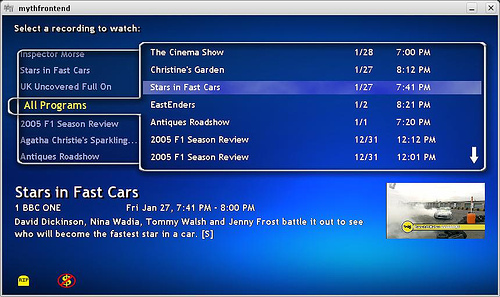 Record a title once per day from any of the times that appear in the TV listings beginning from the time of the showing that was selected when the rule was set. This is useful for news, current events or other shows where the same episode is shown several times each day but the listings may not include descriptive information. 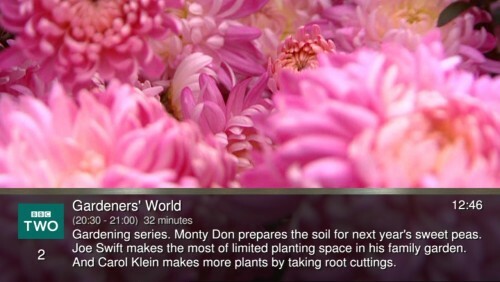 This may not be a good choice if there are different episodes shown during the day. Records a show anytime the title is listed on this station. This is perhaps the most common rule to use for most shows. Record this title on any station at any time. This can be useful if a station has sister stations where shows are rebroadcast allowing the scheduler to record rebroadcasts on the other station when the original airing cannot be recorded. If your machines starts to run low in disc space it will start to expire (delete) recordings to make room. The default behaviour is to delete oldest shows first, and is checked every 10 mins. You can mark Recordings as permanent in the Recording Browser. Select the recording you want and press and select "Dont Auto Expire". You can browse these recordings in Main Screen-> Media Library-> Watch Recordings from Mythfrontend. MythTV will show a preview of your recordings if this has been enabled under TV Settings->Playback->View Recordings. You can play a collection of recordings for example all episodes of a particular series. Indivdual recordings from each recording group are on the right of the screen. Use the keys to move between the Recording Groups and recordings. Once you are in the recordings pane, use the keys to move between recordings. Press the key to play that recording. Press to bring up the Recording Information popup. 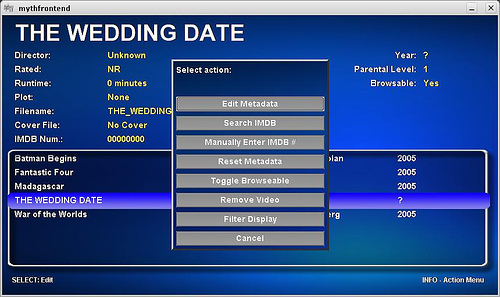 The MythTV master backend is responsible for managing the schedule for all TV tuner cards on the master and any slave. 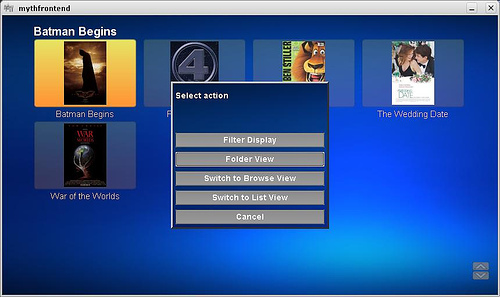 Its job is to search the TV listing for the shows you have requested and assign recordings to the TV tuner cards. If none of the shows that you've chosen overlap, it simply records all of the shows. However, if there are shows where the beginning and end times overlap, the scheduler follows rules that you've specified or makes logical decisions about what would be best if you haven't expressed any preference. If you have a lot of recordings scheduled, you can check to see what they are, as well as resolve any conflicts that the system can't handle, with the upcoming recordings browser. Main Screen->Manage Recordings>Upcoming Recordings. There are two 'views' available. 1.Press to include all of the items that match record rules even if they do not need to be recorded. 2.Press to focus on just the things that will record and items that may need your attention. This tells you if there are any conflicts that would prevent one or more shows from being recorded. The items in the list are colored in the record color for things that will record, white for things that may need attention, gray for those that do not need to record and yellow when there is a time conflict. Items at the top of the list may also be highlighted in red indicating that the recording is in progress. Numbers indicate which card number has been assigned to record the show. Letters are used to indicate the reason that something will not be recorded. You can see what the letter means in the "Record Mode" Below. This is a short status message for the highlighted item that indicates the type of record rule that was matched, the "total priority" for this showing and a one or two word explanation of the status code. Press to see more information about the Recording and to make changes to its status. 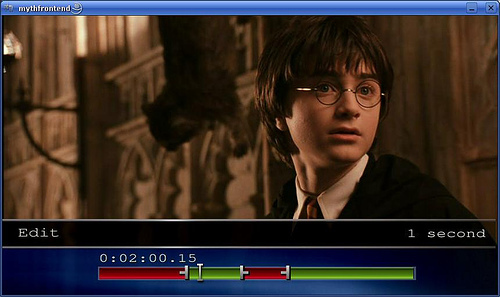 The Editor allows you to remove any commercials that the may not have been detected by the system during recording. You might also want to remove the lead in prior to a show or the overrun at the end of a show. The process of editing is often referred to as creating a Cut List. This is because MythTV does not actually cut the Recording. Instead it creates a collection of in and out points in the database that is associated with that recording. If you now transcode this recording the system will take the Cutlist and produce an edited Recording ready to be exported. 1. Allow users to create MPEG-4 streams to save space. Note this is not used for creating MPEGs for burning to DVD as you will get audio video sync issues, especially with DVB recordings. You need to use MythArchive for this or manually with Project X and DVD Author. MythTV 0.20 plugins now includes MythArchive for archiving your recordings. What follows is for users of MythTV 0.19 or earlier. At some point you will want to archive your TV recordings for safe keeping. There are however some complications with this, due to the way Digital TV content is held on your hardrive. MythTV stores its recordings in the "/mnt/video" directory by default. You will find files in here with a .nuv file extension and a long complicated name based on the recording schedule. These files are in NuppelVideo format.They are effectively MPEG-2 files with special markings to help digital TV cope with any dropped information during broadcast. To archive these files to DVD they will need to be converted into normal MPEG-2 files that are compliant with the DVD standard. There are also prebuilt scripts to do all of the above automagically called MythBurn []. Alternately, you can also use MythArchive. 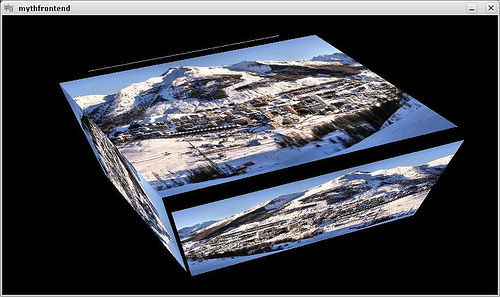 Project X takes a collection of DVB stream files and concatenates them into one big project. You can trim the files here also. It will then create synchronisation marks between the audio and video. You can use the default settings. 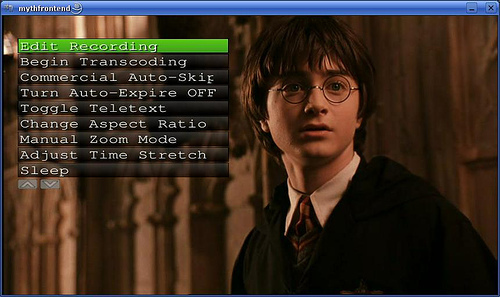 We now can convert the above output video(m2v) and audio stream (mp2) generated by projectX to a DVD compatible stream. We use the mplex command, which is part of mjpegtools. You will then have a .mpg file with combined audio and video all nicely synchronised. 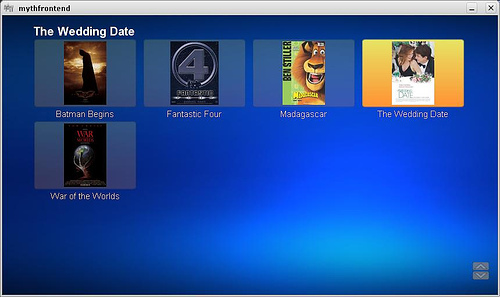 KDE DVD Author [KDE_DVDAuthor]will allow you to create very nice DVD's complete with animated menus. You do not need to compile it. Just download and click on the installer.kmdr icon and KDE will install it. KDE DVDAuthor is a KDE Kommander application. K3B includes a wizard to burn DVD ISO images. You will find it under the Tools pull down. Tools-> Burn DVD ISO image. Just load up the ISO image from step 3. and you are done. 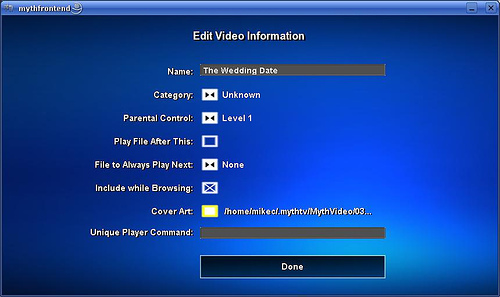 MythTV recordings can be exported into multiple different formats such as iPod or PSP compatible MPEG4 files, DivX and Xvid files, or files to burn to VCD, SVCD or DVD with the use of an external program such as nuvexport, which can be downloaded from https://svn.forevermore.net/nuvexport/. Nuvexport is a command line program that can be used to create a copy of your recording in the following formats: XviD, SVCD, VCD, DVCD, DVD, DivX, ASF, MP3, PSP, iPod, and MPEG2 (though the iPod and PSP export options are currently unavailable). It does not alter the original file in any way, just gives you a new one in a folder of your choosing. 1. Use the internal DVD player. 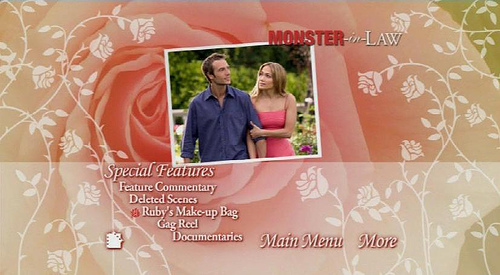 It has complete menu and subtitle support. 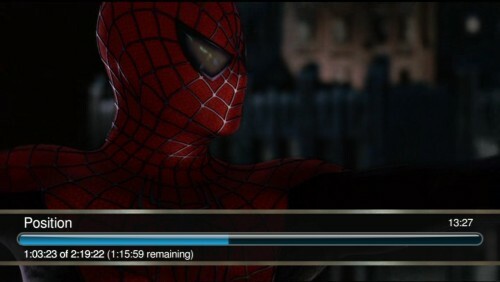 It will also bypass all of the clag such as anti-pirate and FBI warnings and go straight to the main movie. 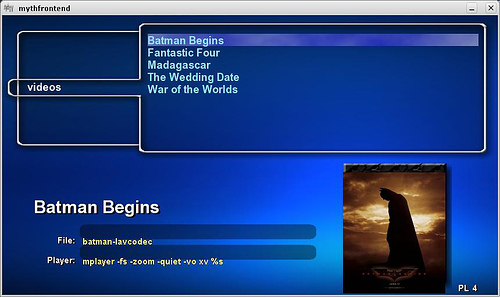 With the internal player you have full DVD menu support, as well as consistent remote control and menu settings. 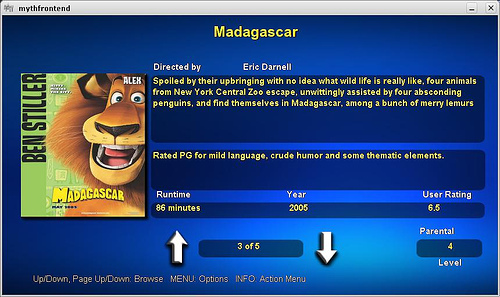 Press to bring up the DVD On Screen menu options. You might find it useful to have a look at the Ripping Guide to set up your system. The MythTV DVD Plugin offers the capability to Rip your DVD's to the hard drive and then compress the movie from its normal 5-9GB file size to 700MB-2GB depending on the final quality that you want. When transcoding the system will use the settings defined in the frontend configuration. The default is to use XVID CODEC. Use the to select the Title to rip. Use the to move between the lines. Press the "Space" key to select the options on each line. press the key to start the RIP. Select Select this Video file for transcoding. A DVD will typically include multiple video files, eg trailers, directors commentary etc. Copy the VOB video and Auido files to a temporary file (apprx 30Min). For "Pefect" it stops here. If you have specified the quality to be "good", it will call transcode to do the .vob -> .avi with xvid or divx. Once Transcode has finished you should find the new compressed movie in your Videos directory, which is visible via the Myth Video manger. 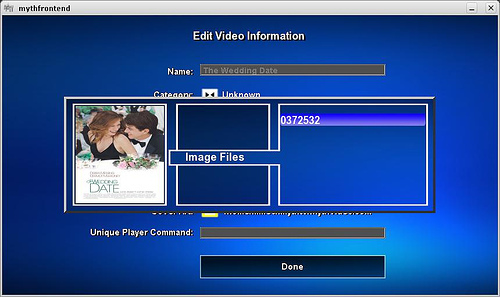 Once you have either ripped DVDs or copied video files to the Video directory you will want to add both movie information as well as DVD cover art. You can do this via the Video Manager. Press "i" and Myth TV will allow you to go the the Internet Movie database and retrieve information on your movie as well as matching Album Cover art. It does this by matching the name of the Movie. If it does not find an exact match it will offer you a list of options. In the event that it is not able to find any match at all, then you can enter the information manually to bring up the OSM. Select "Search IMDB". Myth TV will now go the the Internet Movie database and retrieve information on your movie as well as matching Album Cover art. It does this by matching the name of the Movie. If does not find an exact match it will offer you a list of options. In the Event that it is not able to find any match at all, then you can enter the information manually. 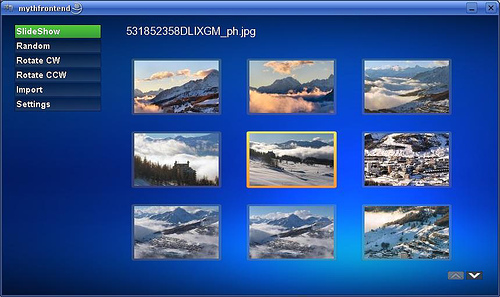 MythTV Gallery Module allows you to view all your photos as well as short movies from your digital camera. Myth Gallery will show your photos as they are organised in your file system. Myth will generate thumbnails of both folders as well as individual photos. Press to view photos within the desired directory.You will then see the individual photos themselves. Press to view just that photo. Press to get information on that photo. While viewing photos you can use the to jump forwards and backwards between photos. Press to exit photo viewing. Press to highlight the On Screen Menu. You can now only use the to move around the pictures. 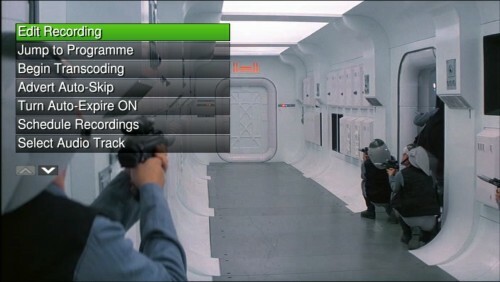 The will move up and down the On Screen Menu. Here you can change the slide show transition parameters. Check the use Open GL transitions and you can now choose some of the funky transitions available. There are 4 main commands implemented currently: jump, key, play, and query. Typing 'help <COMMAND>' gives you help on that specific command. when playing a recording or LiveTV. So, with the current implemention, you can telnet to a port, instruct mythfrontend to change to the Watch Recordings screen (jump playbackbox),and start playing a recording (play program 1031 2005-10-17T22:00:00). Then during playback, you can pause, change speeds, seek around, and stop playback. You can query the current screen and jump to other locations including the main menu.